For the examples on this page, the source files came from a variety of formats including Shape, JPEG, TIF, Sketchup and others. In one workspace I wrote out to 3D PDF, and in another workspace I wrote to Geodatabase. 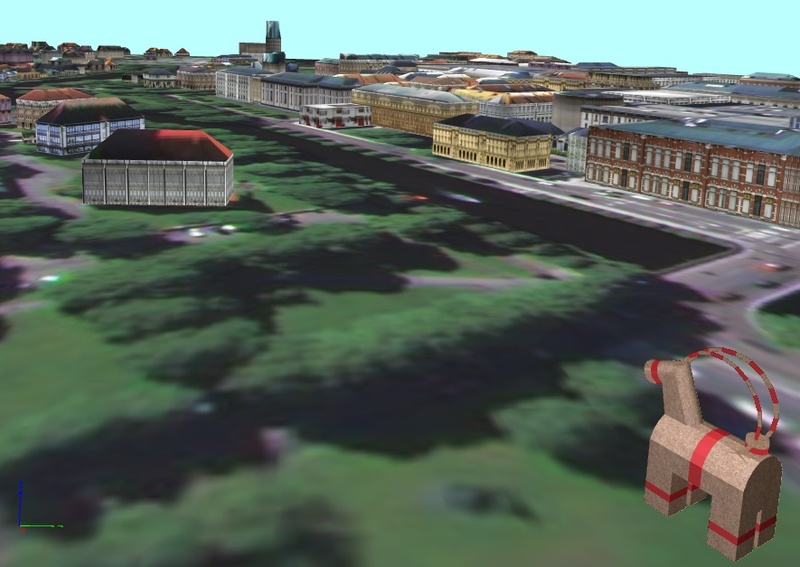 It's interesting to note that people who want to browse parts of 3D cityscapes in ESRI ArcCatalog don't need to write translate data into Geodatabase however, as FME 2010 now extends the browsing capabilities of ArcCatalog such that users can simply view 3D data from a variety of formats without translating it. Most of these examples showcase the new texture support for 3D objects being introduced in FME 2010, but it's valuable to know that the new release will offer support for a whole new list of 3D formats including 3ds, Sketchup, AutoCAD Civil 3D and Collada. You can view the listing of the formats supported in the current release of FME at: www.safe.com/Formats. 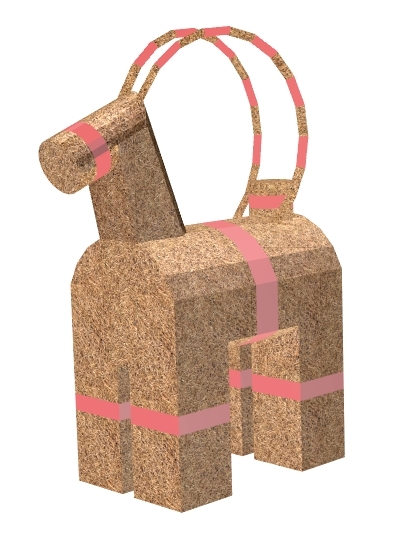 When our PDF 3D writer writes rasters, it replaces them with faces using raster as a texture. This replacement can also be done with the the updated FaceReplacer transformer. This makes the creation of backgrounds for 3D models really easy (as long as the terrain is flat and when the raster is georeferenced). Use RasterTiler to make several tiles of a smaller size. 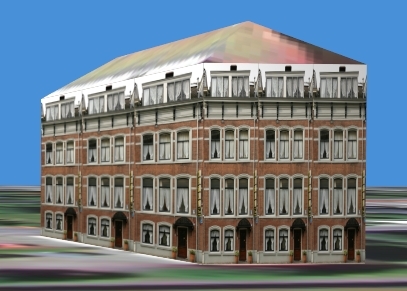 The buildings provided by the City of Gävle contained two attributes that helped us to generate 3D roofs - the maximum (HOJD_TAKNO) and the minimum (HOJD_TAKFO) roof elevations. Using CenterlineReplacer, we generate axes that will represent roof ridges. The building footprints are elevated to the minimum roof elevation, and roof ridges are brought to the maximim roof elevation. After that, we can use this data in TINGenerator to make surfaces for each roof. Building footprints also serve as clippers for the source image so that after Clipper we get multiple images representing building roofs. Now, having roof surfaces and roof textures, we simply combine them together with AppearanceAdder, and roofs are ready. Unfortunately, we don't have real textures for the City of Gävle, so we had to come up with some technique of random texture assignment. Using building area sizes and heights, we separated them into three groups representing commercial, apartment and low-rise residential real estate. Based on that, we generated two texture parameters, which control how many times each texture should appear horizontally and vertically. We also set up our texture reader (JPEG reader) in such a way, that it reads and uses everything available in the respective folders under texture folder - \commercial, \residential, and \apartments. You can place your own images in these folders, and they will be used in your output. For each texture, we generate texture_id attribute with the Counter transformer - there are three ranges of those ids - starting from 0 for residential, from 1000 - for commercial, and from 2000 - for apartments. Depending of building type (commercial, apartment, or residential), we generate random _texture_id on buildings also in three ranges. Generate_walls custom transformer takes building footprints, chops them into two-vertex lines, makes walls by extruding these lines to minimum roof elevation, and assigns textures to walls using texture_id as a Group By attribute. The Gävle Goat, as tells us Wikipedia, is a giant figure of a traditional Swedish Yule Goat. 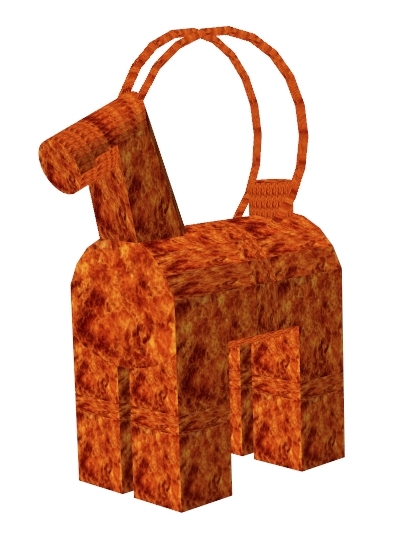 This straw goat is known be a target of arson attacks, and this is why Dale asked me to take a SketchUp model fot he goat, and replace straw texture with fire. Many thanks to the City of Gävle for providing us with this dataset. Thanks to our development team for their efforts in making FME 3D capable, and for creating the workspace. photos of the walls for textures with some way of identifying to which side each texture belongs. Models of the features that you would like to see - poles, trees, bus shelters, fences, etc.